We first got word of 100 Rogues late last year. 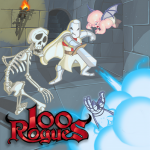 Much like Sword of Fargoal, 100 Rogues seems to be taking the classic roguelike formula and sprucing it up quite a bit with colorful art, animations, and multiple character classes. Of course all the roguelike staples are in place such as randomly generated maps and permadeath as well as modern features like online leaderboards. I’m a huge fan of the roguelikes, and I really like that developers are taking such an excellent genre and making it approachable to people who likely don’t even know what a roguelike is. Getting used to permadeath takes a bit of adjustment, especially with how many video games lately have been trending towards regenerative health systems (Such as nearly every first person shooter released recently.) but few gaming experiences are more rewarding than retrieving whatever magical item you’re searching for at the bottom of a treacherous dungeon without dying. If you’re looking for a great roguelike to play while you wait for 100 Rogues, check out both Rogue Touch [$2.99] and/or Sword of Fargoal [$4.99].